Getting a better understanding of the evolution and nucleosynthetic yields of the most metal-poor stars ( Z ¿ 10 ¿5 ) is critical because they are part of the big picture of the history of the primitive universe. Yet many of the remaining unknowns of stellar evolution lie in the birth, life, and death of these objects. We review stellar evolution of intermediate-mass Z = 10 ¿5 models existing in the literature, with a particular focus on the problem of their final fates. We emphasise the importance of the mixing episodes between the stellar envelope and the nuclearly processed core, which occur after stars exhaust their central He (second dredge-up and dredge-out episodes). The depth and efficiency of these episodes are critical to determine the mass limits for the formation of electron-capture SNe. Our knowledge of these phenomena is not complete because they are strongly affected by the choice of input physics. These uncertainties affect stars in all mass and metallicity ranges. However, difficulties in calibration pose additional challenges in the case of the most metal-poor stars. We also consider the alternative SN I1/2 channel to form SNe out of the most metal-poor intermediate-mass objects. In this case, it is critical to understand the thermally pulsing Asymptotic Giant Branch evolution until the late stages. Efficient second dredge-up and, later, third dredge-up episodes could be able to pollute stellar envelopes enough for the stars to undergo thermal pulses in a way very similar to that of higher initial Z objects. Inefficient second and/or third dredge-up may leave an almost pristine envelope, unable to sustain strong stellar winds. This may allow the H-exhausted core to grow to the Chandrasekhar mass before the envelope is completely lost, and thus let the star explode as an SN I1/2. After reviewing the information available on these two possible channels for the formation of SNe, we discuss existing nucleosynthetic yields of stars of metallicity Z = 10 ¿5 and present an example of nucleosynthetic calculations for a thermally pulsing Super-Asymptotic Giant Branch star of Z = 10 ¿5 . We compare theoretical predictions with observations of the lowest [Fe/H] objects detected. The review closes by discussing current open questions as well as possible fruitful avenues for future research. Gil Pons, P. [et al.]. 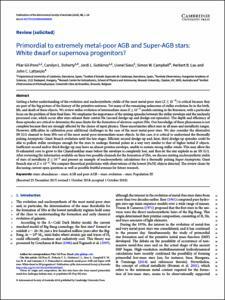 Primordial to extremely metal-poor AGB and Super-AGB stars: White dwarf or supernova progenitors?. "Publications of the Astronomical Society of Australia", 29 Novembre 2018, vol. 35.